The name Banksias was decided after a BBQ at the Kenthurst clubhouse in 1988. It was adopted as the Banksia is an Australian native plant, which frequents the Hills District in a wide range of species. We proudly wear the emblem on our caps, shirts and other club apparel. The motivation to form the Kenthurst Banksias was the opportunity to play cricket abroad, primarily at the home of cricket – England. This ideology was born in 1987 when an “Alternative Ashes” series was held at the Kenthurst Cricket Club over four days. The club entertained visiting English teams enjoying a competition with an international spirit, as well as making many friendships with a number of our English visitors. 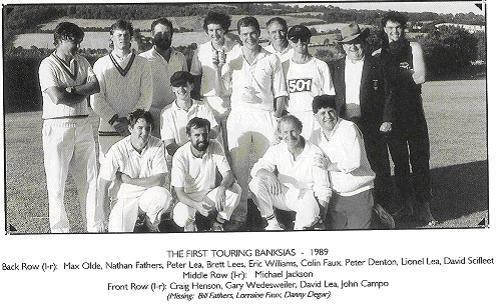 At the conclusion of the tournament it was decided that we would send a team to compete in the United Kingdom in 1989 for the next “Alternative Ashes” tournament, coincidentally of course, to also have the opportunity of watching our Australian team in their quest to retain “The Ashes”. The tour also gave our players the opportunity of travelling to other countries and thus providing us with the opportunity of promulgating the game, which we all love, to other areas and of course the opportunity of establishing new acquaintances. Over the last 4 years, the Banksias have mainly toured other capital cities in Australia to watch the Australians play test matches against other countries. Tours have include Brisbane, Adelaide and Perth in 2009.